API Pimafix is an all-natural, antifungal remedy for fish fungal infections, with a formula derived from the West Indian Bay Tree – a proven natural antifungal. 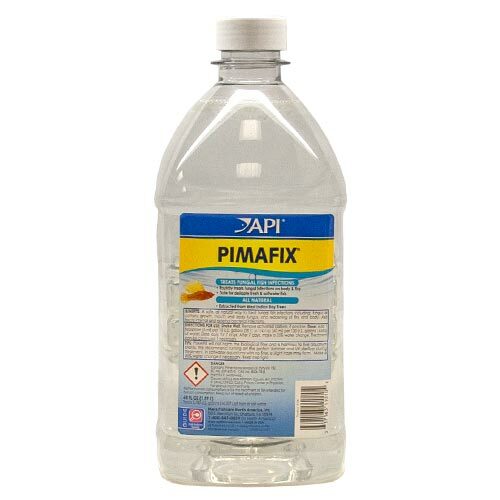 API Pimafix rapidly treats cottony growth, mouth, body fungus, and the reddening of the fins and body, in addition to both internal and external bacterial infections. It will not adversely affect the biological filter, alter pH, or discolor water, and has been formulated to use in conjunction with Melafix to enhance effectiveness against fish diseases. Directions for use: Add 5 ml per 10 gallons of aquarium water. Dose daily for 7 days. After 7 days, make a 25% water change.